Clean the mushrooms with paper towels (or clean pastry brush), and slice coarsely. 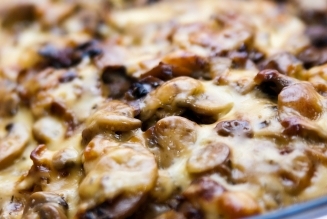 Heat the oil in a frying pan, add the lemon juice and mushrooms, and cook for a few minutes. Add the butter, and cook a few minutes more, until the liquid has evaporated. Season with salt and pepper to taste, and add the parsley. Add the cheese, and cook a minute or so more, just until the cheese starts to melt. Mix gently, and serve immediately.